Massive credit must go to author Simon Maginn (@simonmaginn on Twitter) for his big investment of time and effort to do the ‘grunt-work’ putting together the information I’m about to share with you. All of this information is on the official record, but you will struggle very hard to find a single mention of it in the media as they tout the HSMR statistics compiled by Doctor Foster Intelligence (DFI) and its subsidiary unit, Doctor Foster Unit (DFU) at Imperial College. 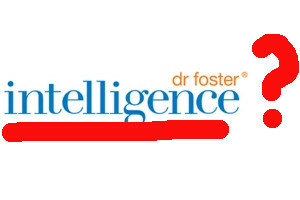 There is no ‘Dr Foster’ involved (and arguably not much ‘intelligence’ of any type we’d appreciate) – it’s just a play on an old nursery rhyme – but this commercial company and its statistical spokesman Professor Sir Brian Jarman have enjoyed a very high profile over recent months during which hospital after hospital has been falsely accused of effectively killing patients by the media. The DFI statistical method devised by Professor Jarman is considered discredited in many quarters, and of dubious use in many more, but he is wheeled out to give damning assessments to the media based on his statistics as if there is no question-mark against their validity. To be fair to Prof Jarman, in conversations on Twitter he will admit that his statistics give no indication of avoidable deaths – but on the TV and in newspapers this fact is undiscernable, and he has participated in discussions of avoidable deaths without making this point clear. This has contributed to the misleading of the uninformed public into losing confidence in the NHS and believing that there are massive numbers of avoidable deaths in our health service. Prof Jarman has a serious conflict of interest: his son Julian is a partner in DFI and stands to profit from the raised profile of the HSMR method that DFI exploits commercially. This may be unconnected to the Professor’s actions, but the question should at least be asked and investigated by the media when they push his viewpoint – but it is not. So far, so questionable. But it turns out that this is not the only unhealthy-looking aspect to the sudden resurgence of HSMRs and, with them, DFI. DFI was formed in 2000 by two Newsgroup journalists, Tim Kelsey and Roger Taylor, to exploit Professor Jarman’s statistical method for commercial gain. DFI’s first ‘Good Hospital Guide’ league table was published in 2001, and much of the company’s business – as became evident during Taylor’s evidence to the Francis Inquiry – is based around selling its services to hospitals concerned about their position in the league table. Professor Jarman, both to the Francis Inquiry and subsequently, has complained with some bitterness about the Labour government’s lukewarm attitude toward his statistical method. This may be just the equivalent to a jilted suitor criticising the girl for not wanting him. Or it might not – it turns out that there is a contractual basis for his dissatisfaction. In 2006, the Department of Health – driven by a senior civil servant impressed by the ‘vision’ of Tim Kelsey – decided to buy a 50% stake in DFI via its NHS Information Centre (NHSIC, at that time simply IC) subsidiary. For about 50% more than its market value. This wording obliges the government to work hard to help DFI make money and to otherwise promote its interests, as well as to use DFI as the main source of NHS information. This agreement was entered into without any due process of tendering, or without even examining what the government thought it could gain from investing in DFI, who were of course publishing their statistics anyway. It wasn’t long before this drew attention from the Commons Public Accounts Committee (CPA), who published an extensive report into the deal by the middle of 2007. The CPA, like the National Audit Office, concluded that due process had not been followed, that the government had ignored normal competitive process and had overpaid. The CPA went further, and hammered the government and its civil servants for being ‘in bed’ with DFI and for discouraging other organisations from participating in attempts to harness data for the benefit of the NHS and its patients. But, as Prof Jarman observed, under the current, Tory-led government there has been an ‘improvement’. I don’t suppose that the government’s shameless abuse of statistics (and not only in the NHS!) and its persistent repetition of mortality claims that it has been told time and again, would be considered an ‘improvement’ by most people. But it’s certainly a lot more in line with the obligations of joint-venture contract that the CPA called ‘borderline dodgy’ (I suspect the ‘borderline’ was diplomatic). And now for a word from our sponsor..
To summarise the history lesson, in just five short years two journalists and an academic with a theory became the government’s sole official provider of health statistics and ‘intelligence’ (again that word – it reminds me of the old soldiers’ saying that ‘there is no such thing as military intelligence’). Not only that, but they had succeeded in talking the government into overpaying for the privilege of contractually obliging itself and its successors to ‘promote’ their interests. The then-Labour government ‘cooled’ toward that commitment, but the current government, with enthusiastic help from its media allies and serfs, is making up for the ‘neglect’ in spades. At every opportunity, and in spite of the whole statistical method being widely discredited, the media and Jeremy Hunt are repeating claims that thousands died ‘needlessly’ in NHS hospitals from Stafford to Basildon and many points between. And the charge to discredit the NHS in the eyes of the public is being supported by a Professor with questionable motives, whose ‘baby’ was neglected and now has a chance of respectability again, and whose son stands to gain financially from it. An ‘obligation to promote’. A joint commitment between the government and a commercial statistics company to the financial and general interests of that company. Any comments or quotations on NHS mortality statistics from Prof Jarman, Jeremy Hunt or any government or DFI spokesman, should come with one of those ‘advertisement’ warnings at the top of the screen or page – and should be trusted about as much. Well argued and researched. Thank you for a huge contribution to the rational use of health service data and your campaign against the misue, deliberate or otherwise, of statistics. If I may add one further nugget of information, when DFI was set up with 50% Funding by the Government, part of the agreement was that DFI would get preferential and complete access to the hospital episode statistics to allow it to produce the analyses, including the much suspect HSMRs. At the time, many of us in the NHS ESP in public health and in Information departments were amazed at the cavalier way publicly collected data was handed over to a private company to exploit, while many in the public sector were given access only to a more limited data set. To make matters worse, the exact methodology used to calculate the HSMRS were not made public so that independent verification of the results of the analysis was not possible. Because of the potential implications of having an HSMR figure on the wrong side of 100, many Trusts began to hire DFI and other data companies to do their figures for them in advance of the publication of DFI league tables in the Sunday Times. All the time there was a great deal of epidemiological and statistical expertise available within the NHS and within National Statistics (at that time ONS) to carry out a rational analysis of the data. But careful measured analysis and balanced reports would never have made an exciting and juicy story, and with journalists in charge of the data lurid headlines were inevitable. Scientific integrity and cautious interpretation of the data were sacrificed in the search for a single number that could not possibly measure the quality if health services. Brilliant additional info, Jammi – thank you! Reblogged on http://smilingcarcass.wordpress.com/2013/08/03/mortality-stats-govt-in-bed-with-dr-foster/ and tweeted, FaceBooked. The whole thing was a nonsense at the start. Dr Foster took publicly available data from hospitals, messed about with it and then put it into a league table that they set the criteria for. Chief executives up and down the country of excellent hospitals then disputed the figures as tripe. Then dr foster started charging PCTs for access to the type of data that the DH could and should have been providing free by an in-house team of analysts. The data was rarely robust or adequate. Given this sort of background, the fact that Stafford, Basildon etc are providing any sort of secondary care, let alone good care is nothing short of a bloody miracle. Has anyone thought of publishing the general hospital component of the big teaching hospitals’ HSMR separately from the overall figure that includes all the (eminently more controllable) tertiary work? Only kidding but you get the point! Thanks for your very thoughtful article! DFI is planning another hospital guide now and mortality again is the top priority due to Francis report. I had chances to meet many information staffs in the hospitals. I can feel how they are scared of DFI due to hospital guide. They spent a lot of money on DFI’ RTM service but many of them are still confused how HSMR is being calculated over many years. DFI claimed they published the HSMR methodology but the document available is vague and missed many details. There is no any publicly independent validation for the methodology over more than 10 years. Regarding the relation between DFI and DFU, even an idiot can see they are not independent at all. The research funding to DFU is provided by DFI, how can they be independent? The disputes on HSMR had been going on for many years (in NHS and BMJ papers). That is the reason why a new indicator SHMI was defined with a great transparency. It is independently validated by technical group members. I do not understand why many top officials are still promoting the use of HSMR. If still using HSMR, what is the point to develop a new one by using taxpayers’ money? I have a feeling that the whole NHS has been hijacked by DFI and DFU but hospitals managers have no choice and forced to pay a lot of money to DFI for over 10 years now. To be fair, apart from using HSMR to publish league table, DFI did provide useful tools and promote the wider use of intelligence in the NHS. But this job should be done by information centre instead of a commercial private company. The reason is that HSMR is less transparent and less accurate, and therefore a more useful weapon for making the NHS look bad. A miserable state of affairs.